If you thought setting up a Google My Business (GMB) account was just an optional “nice to have” for your business, think again. For people searching for your business on Google, your GMB listing is essentially a digital storefront. 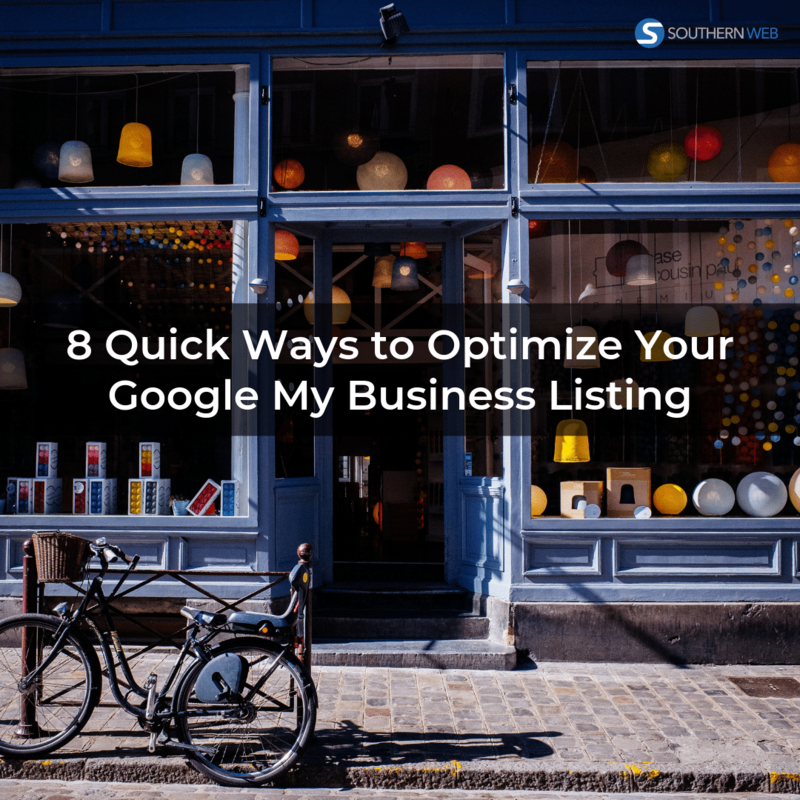 In this article, we walk through the benefits of claiming and using your Google My Business listing as well as share 8 quick ways to optimize it to its greatest potential. But first — what exactly is Google My Business? Google My Business creates business listings that includes information like business location, hours of operation, customer reviews, links to the business’ website and social media, photos, posts, and so much more! If you’ve ever searched for a business on Google, you’ve likely seen these listings pop up. While the primary purpose of these listings is to give search engine users easy access to actionable information, GMB also offers business owners greater control over what shows up in search results when someone searches their business name. Make it easier for potential customers to find you, both online and at your brick-and-mortar location. Suffice it to say, if you’re a business owner and you haven’t taken full advantage of this free listing, you could be missing out on potential customers and leaving money on the table. That’s why it’s important to take the time to properly optimize your Google My Business listing. Optimizing your GMB listing is fairly painless, and it can yield excellent results for the small amount of time you invest in it. Continue below a few quick ways to set your Google My Business listing up for maximum results. 1. Claim and verify your GMB listing if you haven’t already. Google automatically creates a generic listing for businesses it identifies online, but the information is often incomplete or inaccurate. Claiming and verifying this listing puts you in control of what is displayed there, and ultimately, it is the first step to optimizing the local findability of your business. 2. Fill out ALL the information on your GMB listing. 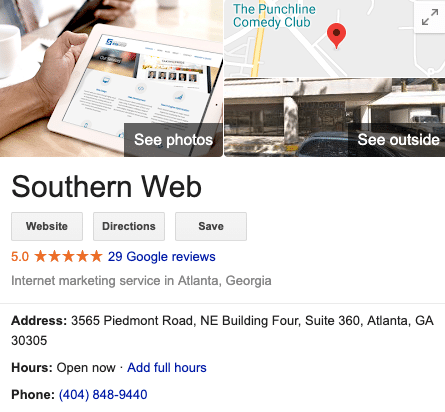 Southern Web’s Google My Business listing. This includes sharing your business’ description, location, phone, hours, website, social media links, and anything else that is applicable for your business. First and foremost, you want to include this information to help your customers, but that’s not the only reason to add all your business information. If you leave this information blank, another user (including, perhaps, a competitor) may fill in the gaps for you by making “suggestions,” and the information may be incorrect. Take control of this information, and revisit your GMB listing regularly to make sure the info stays updated and accurate. 3. Upload quality photos and videos that feature your business. Google likes images and videos, and so do users. In addition to having your company logo uploaded, you may want to add additional imagery that reflects your work, your products, or your company culture. This is how uploaded images appear on a Google My Business listing. For brick-and-mortar locations, you may want to add photos of the exterior and interior of your establishment. If you’re a restaurant, you may want to add photos of the food and drinks you sell. If you do work for clients, you may want to include photos from your portfolio. Those are just a few examples — again, the exact images and videos should depend on the type of business you do. Potential customers will often go through these images to decide whether or not to visit you location or buy your products and services, so make sure they are attractive and useful! 4. Ask your current customers to provide Google reviews. 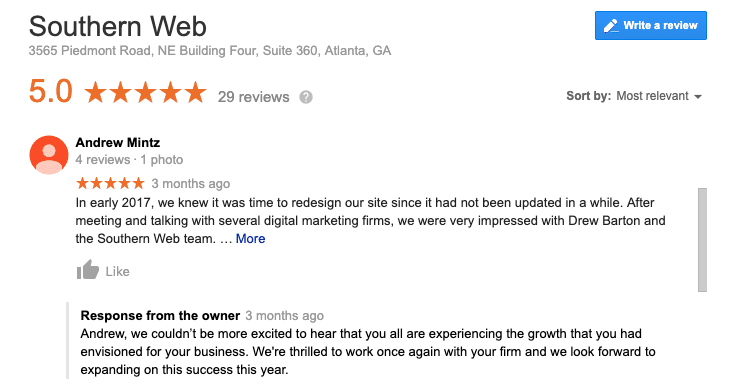 These reviews will show up as part of your GMB listing, along with a star rating based on the average of the reviews. Many users will quickly decide whether to visit you based on the star rating alone, so if you can get your satisfied customers to talk about you online, you’re ahead of the game. So how do you get customers to leave a review? Ask them! You can even make it extra easy for your customers by creating a link that directs them to leave a Google review. This is how Google reviews (and review responses from the business owner) appear on a Google My Business listing. 5. Once your customer reviews are posted, respond to them! This includes responding to negative reviews as well as positive. Interacting shows people that your business is active and interested in a positive customer experience — and that you are actually reading the reviews. It also gives you an opportunity to diplomatically set the record straight or resolve customer gripes, basically giving you the last word. 6. Answer customer questions using the Q&A feature. Again, this gives you the opportunity to engage your existing customers online, as well as with potential customers who are still deciding whether to visit you. 7. Post relevant articles and news items to your profile. Here’s where you can treat your GMB listing almost like a mini-social media account that displays right in Google’s search results. Link to your latest blog post, unveil a new product, announce an event or sale — anything to generate customer interest. Add photos and a call to action where appropriate for maximum impact. 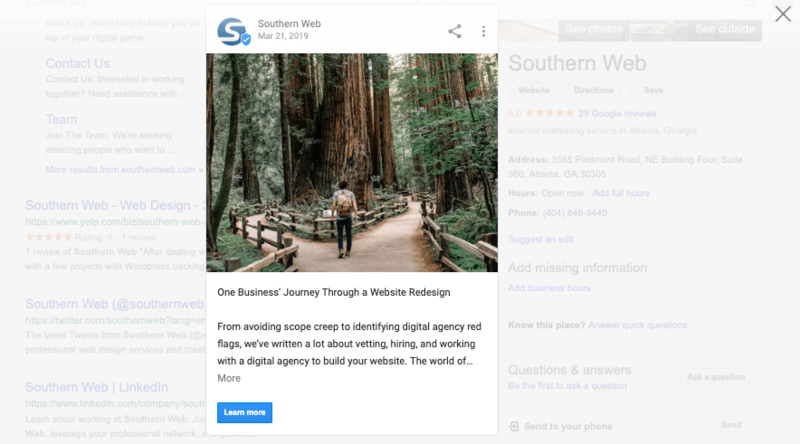 We featured this blog as a “Post” on Southern Web’s Google My Business listing. The big trick with this one is to update it regularly — even if you add a new post once a month or every few weeks, that’s a a solid start. 8. Set special hours for holidays. If you’re extending your hours for the holiday shopping season, you want your customers to know you’re open. Conversely, if you’re closed for a holiday, you don’t want a potential showing up only to be disappointed. You can keep all this information current on your GMB listing. How else can I improve local SEO for my business? We can help with that! Contact us today to learn how a local SEO campaign can improve the visibility of your business in search engines.